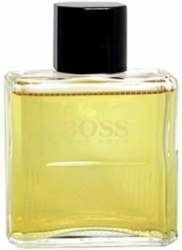 Boss No.1 is the original Boss fragrance introduced then as simply Boss, but replaced its name in 1998. While the name change might be confusing, the scent remains the beloved same. The complex fougre unfolds with the spicy freshness of coriander, cardamom, and nutmeg. Top fragrance notes include bergamot, citrus and honey. The middle notes are coriander, amber and moss and the base of the fragrance are sandalwood, leather and cedar.